Foot Gangrene | What Is It | Where Does It Come From - FOH Inc. Foot Gangrene: What Is It? What Does It Look Like? Warning: The pictures you are going to view on this website are graphic and not for the faint of heart. Foot gangrene, as a part of diabetes and/or atherosclerosis management, has become a major medical problem. This website is intended to allow you to manage your own care, ask the right questions, insist on adequate management and information, and seek an optimal outcome for yourself as an informed patient. Perhaps it will even help the health professionals - vascular specialists and foot doctors (chiropodists, podiatrists) - who are giving care to better understand and, hopefully, incorporate into their practice the nutritional approach to gangrene - its prevention and treatment. Please note that this website is not intended for “most people." It is written for those who want to stand out in self-health care. If you are such a person, we strongly advise that you give serious thought to all of the suggestions about how to stop the progression of gangrene, dry foot gangrene in particular. If you are tempted to think the suggestions are too complicated or simplistic, or even biased, we assure you they are not. 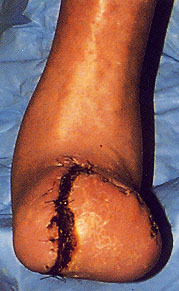 In most cases, foot gangrene is a result of the compromised blood circulation, an insufficient oxygen-rich and nutrient-dense blood supply usually caused by arterial - femoral, popliteal or tibial - obstruction (the human tissue dies from oxygen deficiency more rapidly than when deprived of any other nutrient). The lumen of the artery becomes progressively narrowed up to the point of complete occlusion (blockage), causing normal blood flow to stop. In other words, gangrene develops if the blood supply deteriorates to a stage where insufficient blood is available to keep the tissues alive. When gangrene develops dire calls for medical help often are too late as standard interventions are only temporarily and - most of the time - minimally effective. In early stages, dry foot gangrene causes dull, aching pain - the affected area is extremely painful to touch. 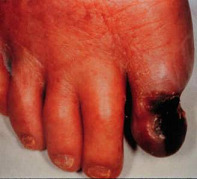 In later stages of dry gangrene, the skin gradually changes in color to a dark purplish-blue, then completely black. amputations - procedure involving the surgical removal of entire parts of the body (toe, foot, or leg). Unfortunately, there is still a common perception that gangrene represents an unstoppable and irreversible process - - a foot severely starved of blood cannot survive - - the only "solution" to which is to amputate an affected limb in order to preserve your life. Although this fatalistic perception often is not true, left untreated, gangrene - depending on the severity of someone's condition - can be fatal. 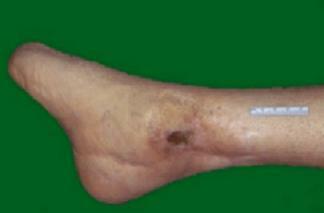 lower extremity arterial occlusive disease due to a clogged or obstructed artery (thrombosis). The second contributing factor in developing of gangrene, and at the same time one of the underlying causes of atherosclerosis, are the degenerative changes associated with chronic type 2 diabetes (diabetes mellitus). Unfortunately, the individuals with dry gangrene most often have multiple other health problems that complicate recovery, and it is usually those other system failures that can prove fatal. I've seen first-hand what gangrene can do… My mother had it and lost her toes, then her foot, then her leg to above the knee. It started out with a non-healing ulcer on her toe. The veins in the feet are very small and when circulation becomes compromised, sores do not heal very well. If not treated promptly, they can progressively worsen and become a breeding ground for bacteria and gangrene results. When the docs went to amputate my mom's leg, they removed the leg to the point where she had the best circulation, so that it would heal properly. I used to work in pathology and we would receive all the surgical specimens to examine and most of the gangrene was in older people with poor circulation, many times not caused by diabetes. Gangrene usually follows a disorder that cuts off the blood supply to a diseased or injured area of the body resulting in an inability of the tissue to repair, thus stay alive. Dry gangrene, also called secondary gangrene or mummification - the most common category of gangrene - is a complication resulting from degenerative changes associated with chronic diseases, such as diabetes mellitus and/or atherosclerosis. It is caused by a gradual reduction in the blood supply to the tissues, and is almost exclusively limited to the extremities - especially feet and toes. In other words, when tissues are deprived of the nutrients and oxygen carried by blood, they begin to die. In early stages, dry gangrene causes some dull, aching pain - the affected area is extremely painful to palpate (feel, touch). Then, it becomes cold, dry and wrinkled. completely black (resulting from formation of iron sulfide from decomposed hemoglobin). With the withering, drying out of tissue, little tissue liquefaction and, generally, with no bacterial decomposition (hence the term "dry gangrene" or "mummification"), this condition may continue unnoticed for weeks or months, especialy in elderly persons. Finally, the affected gangrenous tissues become visibly separated from the surrounding healthy tissues. Utimately, they become dessicated (dried up) and mummified. Dry gangrene of this magnitude is rare except when patients refuse amputation. Once again, areas of dry gangrene are initially characterized by a red line on the skin that marks the border of the affected tissues. As the blood supply deteriorates to a stage where insufficient blood is available to keep the tissues alive so they begin to die, dry gangrene may cause some pain in the early stages or may go unnoticed, especially in the elderly or in those individuals with diminished sensation to the affected area. autoamputate and fall off without surgery (this applies mostly to the gangrenous toes that are stable and have no signs of infection). Wet (moist) foot gangrene is the more serious condition, as it usually indicates a bacterial infection that may spread and be fatal. It presents like dry gangrene, but is softer to touch with copious tissue liquefaction (hence the term "wet gangrene") and an offensive odor, smell. The foot or toe may be swollen, red and warm. PVD and infection are often closely linked, as poor circulation leads to failure of the body to fight off infection in peripheral areas such as the feet/ toes. In general, wet (moist) gangrene usually develops rapidly more due to blockage of venous blood flow rather than arterial blood flow from thrombosis (blood clots) and/or embolism (blood vessel occlusion), generally described as thromboembolism. In thrombosis, a blood clot – called thrombus - is always attached to the vessel wall and never freely moving in the blood circulation. In embolism, however, a blood clot – called an embolus - is completely or partially detached from the vessel walls and freely carried by the blood flow to various parts of the body where it can block the lumen (venous or arterial cavity) and cause its obstruction or occlusion. Ischemia – an insufficient blood supply, especially oxygen resulting in micro clots and/or necrosis. The sooner gangrene is caught, the better the prognosis will be. However, bedsores also appear on the buttocks due to sustained pressure. Ulcerations of tissues deprived of adequate blood supply by prolonged pressure can develop quickly, progress rapidly and are often difficult to heal. Yet it is said that many of these pressure sores (wounds) do not have to occur. And rightly so! In is our experience, the Clear-G Formula helps prevent and - over a period of time - reverse bedsores by restoring and maintaining the skin's integrity and encouraging the healing of pressure sores/decubitus ulcers. Doug was typical of a diabetic who paid the price for ignoring a foot problem. When he was first diagnosed with type 2 diabetes, he thought, "Oh, I feel fine, there's nothing the matter with me." In late August , he noticed a small "bruise" on his left foot but didn't think much of it. When the "bruise" began to spread, he soaked his foot in hot water, but didn't notice that he had scalded his foot badly, making matters worse. Gangrene set in and he lost a couple of toes. Despite his best efforts, the problem only grew. Doctors said the only treatment was an amputation. He was scared. He certainly didn’t look forward to losing part of his leg. Unfortunately, while the amputation surgery went well, another complication of diabetes hit Doug. 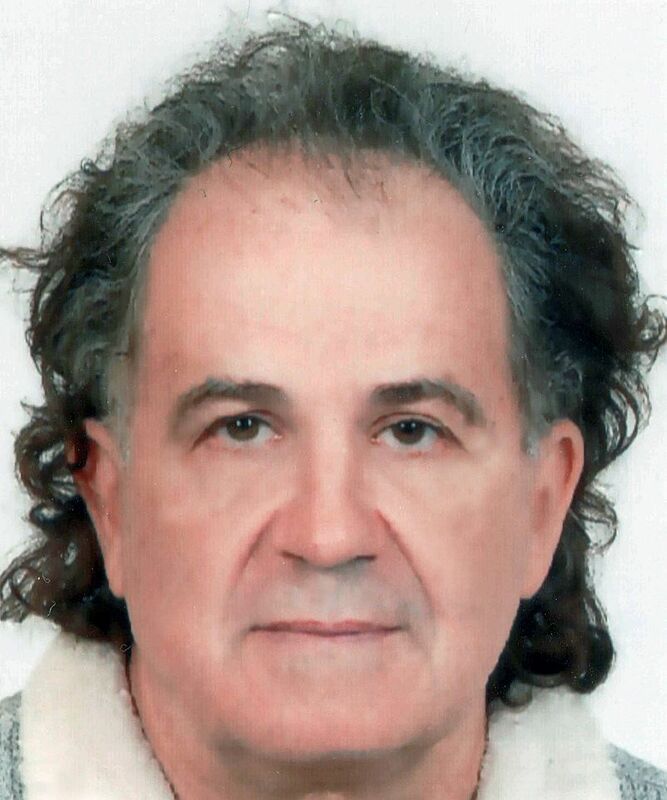 He suffered a fatal heart attack days after the operation. There are no guarantees when it comes to surgery. Standard medicine has an answer at hand - usually, surgical procedures - to remove quickly the dead tissue and "restore" impaired circulation. 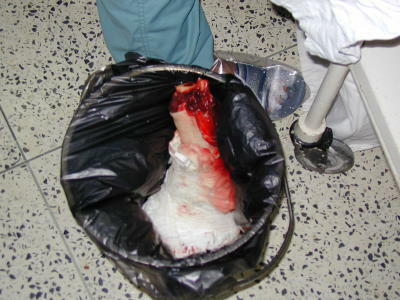 Gangrene is often treated by an operation to remove the dead tissue. If it's an area of tissue that can be removed, the operation is called debridement - the surgical removal of lacerated, devitalized, or contaminated tissue. If it's a leg, foot, finger, or toe that have to be removed, the operation is called an amputation - the surgical removal of an affected part of the body. gangrene extends proximal to the metatarsal-phalangeal joint. Gangrenous lesions may be due to emboli, atherosclerosis, or diabetic neuropathy. Below on the left is a photograph of a diabetic foot with a transmetatarsal amputation taken three weeks after surgical intervention (the wound still visible). In people with type 2 diabetes gangrene of the toes - with tissue loss and/or ulceration - is usually developed as a result of the arterial occlusive disease. Lower extremity arterial occlusive disease is a severe arterial obstruction due to the advanced plaque build-up in the arteries which narrows the flow channel. A diabetic patient complains of pain in the toes while lying down (rest pain) which is often relieved or diminished by hanging the foot over the side of the bed. at the ankle (tibial arteries). The pulse distal (down-stream) to an arterial obstruction will be diminished or absent. The patient's history and physical exam are usually sufficient to establish the presence or absence of arterial occlusive disease. The development of dependent rubor, or the redness - a light purple or deep red-violet color - that develops on the foot when it hangs in a dependent position, is a circulation criterium for would healing. If skin develops dependent rubor this is a sign that the skin is clearly ischemic and primary healing will not take place in this situation. Therefore, dependent rubor is an absolute contraindication to amputation at that level. In case of gangrene or ulceration at the foot, the question then becomes - is there sufficient arterial supply to the foot to heal this wound? Physical exam, PVR, and segmental pressures are not able to answer this question accurately. This question can best be answered noninvasively by a measurement of the pressure of oxygen on the surface of the skin, i.e., the transcutaneous oxygen pressure (TcPO2). This pressure reflects the amount of oxygen coming out through the skin, which in turn reflects the amount of oxygen delivered to the skin by the blood. Studies have shown this test to be an accurate predictor of wound outcome. The TcPO2 test can be applied equally well in diabetics and non-diabetics. Normal TcPO2 at the foot averages about 60 mmHg, but 50 mmHg or greater is considered normal. With severe arterial occlusive disease TcPO2 is decreased significantly The average TcPO2 at the foot in patients with rest pain or gangrene is about 4 mmHg. Wound healing is predicted, though not a certainty, for a TcPO2 greater than 20 mmHg and wound failure is predicted for a TcPO2 less than 20 mmHg. For the patient with rest pain or gangrene, segmental pressures and PVR may be supplemented with TcPO2 to determine the likely wound outcome without surgical intervention. if the central body arterial oxygen level is low (hypoxia). Studies have also shown that in about 10 percent of cases wound healing can occur even when the TcPO2 level is zero. An exception to the doppler pressure criteria is in patients with type 2 diabetes whose pressures are often artifactually elevated secondary to the deposition of calcium in the blood vessels making them difficult to compress. As severe arterial obstruction may require surgical treatment, such as construction of an alternative route for the blood (bypass) around the blocked arterial segments, it is necessary to know the precise location of the obstructions. a Doppler (which measures the velocity/speed of the blood). Obstructions are detected by observing a localized increase in velocity as the blood must move faster to squeeze through a smaller area. how fast it is moving. of the entire lower extremity below the knee, if not above it. 85 percent of all transmetatarsal amputations will heal. the vast majority of below knee amputations will heal. at least 80 percent of below knee amputations will heal. only 30 percent of amputations will heal at the below knee position. A photoelectric cell is placed on the toes or at the midfoot level to measure pulsation of blood flow in that area. a 90 percent chance of healing of a digital amputation in the absence of infection. This particular technique is quite useful in determining the probabilities of healing for transmetatarsal and digital amputations. Unfortunately, in most cases, surgery, or amputation is still considered the "only treatment" for gangrene - whenever possible, usually accompanied by large doses antibiotics to prevent infection. The following images contain pictures of long below-knee (B-K) amputation - an amputation of the lower leg between the ankle and the knee (in the distal third of the tibia), also called transtibial amputation. Pictures taken by Wayne Smith, RN in 2000 during his volunteer work at Scheer Memorial Hospital in Banepa, Kavra, Nepal. Due to muscular atrophy and mobility between the tibia and the fibula, the prolonged use of prosthesis may generate alterations in the amputation stump. The most frequently found alteration is the shortening of the distal diameter of the stump, which assumes a conical form and migrates towards the end of the prosthesis socket. This occurs by the approximation of the fibula behind the tibia due to socket compression, creating pressure points that may cause cutaneous (skin) ulcers and make prosthesis use impracticable. Another common complication is the presence of pain at the amputation stump. Its main cause is the presence of neuromas adhered to local scars. However, even on technically adequate amputations, the patient may have pain. Frequent in conventional amputations are also intraosseous circulatory alterations on extremities. They result in a painful amputation stump at lower temperatures. Gangrene in Leg: Bad Death? My 85-year-old mother is in final stages of PVD (bedridden, dementia, tube-fed, etc.) and has now developed gangrene in one leg. We are agonizing over the options (…): amputation (she will almost surely die, since she is so weak and unable to heal, and she will suffer with the surgery) or letting the gangrene run its course. We have been able to research the surgery side with success (it looks bad) but can't come up with much on gangrene progression. We, her children, are caught between what look to be two very bad options, and want only to ease her suffering here at the end. The loss of foot or leg is not like the loss of one's jewel or money. This type of loss is priceless. It means that you cannot walk or run as before. After amputation of a foot or leg, the body weight of an amputee shifts to the other leg. The resulting wear and tear often leads to problems in the other foot or leg, and in a few years similar problems may develop, necessitating another... amputation. If this degenerative process continues, the results may be fatal. Losing a limb has also a negative psychological impact. It leaves amputees feeling depressed, angry, or alone. They feel that they're no longer whole persons; or fear that others stare at them, or avoid them. Loss of limb can be compared to losing a spouse or a child. The first time you see your body after the surgery will be very disturbing. You may be shocked to look down and see that a part of your body is missing. The trauma is deep and multi-layered. So it is not easy to adjust to the loss. 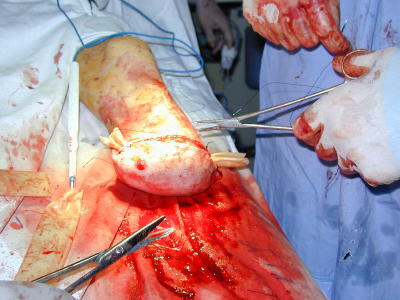 You will have very strong pain after your amputation surgery because the surgeon has cut through skin, muscles, nerves and bone. Your limb will be swollen. Swelling can cause pain and limit movement. After an amputation, the muscles in and around the residual limb shorten. This pulls your joint into a bent position. If it is left like this for long periods of time, it will become difficult to straighten, or even become permanently stuck. Recovery is never a fast process. Each step is difficult: sitting up in bed, then sitting in a wheelchair, standing, then using crutches. Up to 50% of people who have one leg amputated because of diabetes will lose the other within five years. Immediate post-op limb pain - where skin, nerves, bones, and muscle have been cut; it is exeperienced by everyone after an amputation. Residual limb pain - in the natural limb (stump) after the amputation and may be present long after the surgery as the residual limb is usually more sensitive than other parts of the body. Unfortunately, there is no one method or treatment guaranteed to reduce or eliminate residual limb pain. Sometimes surgery is necessary. Sometimes nothing will help. Phantom sensation or feeling - in the amputated "phantom" limb which has been removed, such as itching, tingling, warmth, cold, pain, cramping, constriction, movement and any other imaginable sensation; it is experienced by almost all amputees. The brain is “remembering” the missing part of the limb, and is still “reporting” its feelings. Phantom pain - in the missing or amputated part of the limb; it varies from person to person - a little annoying, very unpleasant, severe, or disabling; it is different from pain in the residual limb and experienced by about 60–80 percent of amputees. Unfortunately, there is not one single guaranteed treatment to reduce or eliminate phantom pain. In most cases, it disappears within months, though most amputees (as many as 40 percent of them) may still experience phantom pain from time to time. Management of post-amputation pain is a major problem and usually requires professional help; however, our understanding of the way at the brain handles pain and other sensations is still fairly crude. By halting the progression of gangrene you will be able to preserve your limb or – when amputation may be unavoidable - reduce the level of amputation, namely, the length and number of functioning joints to maximize motion in the extremity. Clearly, reducing the level of amputation is an important goal for your long-term function. Individuals with amputations of the distal third of the foot (transmetatarsal level) often achieve near normal mobility with the aid of a custom insole. As the amputation level rises so does the energy expenditure necessary to walk. A below knee amputation (BKA) requires a 25 percent increase in energy expenditure to ambulate (walk). Walking with an above knee amputation (AKA) requires 65 percent more energy than the normal state. The possibility of walk after an amputation depends on a number of factors. For instance, a below knee amputation gives the patient the best chance of remaining mobile and successfully walking post-operatively with an artificial leg (prosthesis); 80 percent of below knee amputees will walk. you do not have other illnesses, such as angina or breathing difficulties. It can take between 6 and 12 months for full rehabilitation potential to be reached. Most patients undergoing minor amputation (toe or foot) are able to walk after surgery virtually normally. For the majority of elderly patients with a lower limb amputation the most important aspect is to walk again. Usually, rehabilitation from an amputation in an elderly person is a difficult process. Over half of the elderly patients who undergo a below or above knee amputation never use artificial legs effectively. In order to remain mobile after an amputation the majority of patients need the help of a wheelchair - especially those, who are very elderly or have had other serious illnesses, such as heart disease or stroke. the daily ramifications of the loss of a lower leg. Please note that the following estimation while comprehensive, is not complete and requires further personalized consideration necessary in every case and to provide for special medical needs. In this specific example, estimated annual median cost for goods and services in 2003 dollars is approximately $105,000.00 for Northern California. © 2003, Richard Alexander, a specialist in personal injury litigation. extra oxygen - either by a mask or nasal prongs, or in a hyperbaric oxygen chamber (very high pressures of pure oxygen are used to treat the gangrenous area). Treatments applied to the wound externally (topically) are generally not effective without adequate blood supply to support wound healing. a vessel bypass, to unblock atherosclerotic arterial obstruction/s - whenever possible, followed by a lengthy recovery (a person may need to use crutches, a wheelchair, or a special cast). The other, less common medical treatment of gangrene - IV chelation therapy - is only considered an optional "alternative" to bypass surgery. Extra oxygen - either by a mask or nasal prongs, or in a hyperbaric oxygen chamber - can be life saving at times. Although still controversial, some cases of gangrene can be treated by administering oxygen under pressure greater than that of the atmosphere (hyperbaric) to the patient in a specially designed chamber. In other words, hyperbaric oxygen therapy (HBOT) is breathing oxygen at pressures greater than sea level and requires the entire patient be enclosed in a pressure vessel ("chamber"). It is not achieved by topical application of oxygen to the limb. The theory behind using hyperbaric oxygen is that more oxygen will become dissolved in the patient's bloodstream, and therefore, more oxygen will be delivered to the gangrenous areas helping to treat gangrene. Hyperbaric treatment, helping a person to quickly oxygenate the blood, is usually done once a day for months at a time. reduces the extent of surgical debridement required. However, hyperbaric therapy offers varying degrees of success. It is also very costly and may cause some after effects. Patients must be monitored closely for evidence of oxygen toxicity. Symptoms of this toxicity include slow heart rate, profuse sweating, ringing in the ears, shortness of breath, nausea and vomiting, twitching of the lips/cheeks/eyelids/nose, visual changes, confusion, apprehension, and convulsions. Now they are telling me he is going to loose his foot. They called a vascular surgeon (…) just now. He [my husband] is too weak to undergo a surgery, so I don’t know what will happen to him. Please hellllp, please helpppppppppppp! Somebody intervene and help me now before it is done and over with. COMMENTS: This man was left to die in a heartless hospital because of "costs". No one suggested another therapy to his wife that could save the leg - and the life without surgery. But thanks to the network of Patient Advocates that man was moved to some hyperbaric chamber. It is not for the system or a dispassionate doctor to decide when a man should die. The man in this story wanted to live. His wife wanted to give him every chance. This man is alive today, because someone listened. The efforts of the network of Patient Advocates working together around the country, and moderated by Elizabeth Spokoiny, culminated into the miracle of saving a life. avoid crossing legs when sitting (as it reduces blood circulation in the legs and feet). These are trivial problems in people with a healthy circulation, but for those with impaired blood flow to the lower limbs, they can become major problems that threaten the loss of a foot. All "cut-and-medicate" treatments of gangrene carry with them one main shortcoming: they do little to stop the underlying cause of gangrene, that is the nutrient and oxygen deprivation in the affected areas due to impaired blood circulation. Also surgery (read: amputation) has its limitations. In some cases it cannot be performed as it may put patient's life at even greater risk! Then, such condition is being qualified as... hopeless. "We're sorry, but nothing else can be done," vascular surgeons keep telling relatives of patients'. And this is true - but only from the medical point of view. What makes gangrene, especially its "dry" version, responsive to the nutritional method is the fact that this type of gangrene involves the resultant obstruction only of the arterial blood supply without interference to the venous return. In other words, in dry gangrene the blood flow (circulation) is only partially impaired and the other part (venous system) is still functioning, or ready to function. Therefore, it is able to cooperate by supporting any attempt to restore internally faulty circulation, especially in its arterial part. The other factor making dry gangrene highly responsive to the nutritional method is the fact that this disease is characterized by a gradual progression. In other words, due to relatively slow development of gangrene, there is enough time to support the body nutritionally in order to restore partially impaired circulation - in this case, to unclog arterial blockages. These two factors - the partial impairment of the blood flow and the gradual progression of the disease - have been commonly overlooked, not to say ignored, by standard medical treatments of gangrene. Without improving the flow of blood to the affected limbs - amputation is a futile exercise, although it can be life saving at times. Fortunately, there are people, including a growing number of doctors, who admit that there are successful methods to halt the progression of gangrene, other than temporary medical intervention. One of the natural, non-amputation methods to effectively treat dry foot gangrene is the nutritional revasculatization. Its first and foremost goal is to improve and - over a period of time - restore the impaired circulation in the areas wounded by vascular ischemia (decreased blood flow) - the most common cause of foot ulcers and/or gangrene. The process of natural revascularization can be triggered with an application of nutritional - natural and essential - factors that - when presented in specific ratios and amounts - are able to correct longer standing deficiencies and imbalances which are known to contribute to the circulatory problems. As opposed to standard medical methods of treating vascular ischemia, the nutritional revascularization helps to reduce the impact of factors that created the buildup of atherosclerotic plaque in the arteries. Any wound requires more blood than normal in order to heal. If that extra blood is not forthcoming the wound never heals and in fact dies back. The natural restoration of blood flow to the arteries can be done with the help of Gangrene Clear-G Formula - a targeted, orthomolecular formulation providing a comprehensive support for the entire circulatory system. Simply put, our proprietary Gangrene Clear-G Formula works to improve and/or restore circulation. And improved circulation allows the body to heal itself. What could be better than a nutritional supplement fixing the impaired circulation that develops in a diseased body? There have been medical studies on the beneficial effect of nutritional supplementation on the circulatory system; it appears people with poor blood flow do benefit from specialty dietary supplements. In other words, if you want to stop the progression of gangrene due to impaired cirulation you need to get to the root of the problem. By just pulling a dandelion out by its leaves, you are not going to get very far. Since 2003, we have supplied our Clear-G Formula with an overwhelmingly positive response to our clients and customers in 40 countries: the United States (including Virgin Islands and Hawaii), Canada, Malaysia, Australia, the United Kingdom, South Africa, Thailand, New Zealand, Germany, Belgium, Trinidad, Mexico, Italy, Pakistan, Singapore, Mauritius, Suriname (South America), France, Bolivia, Russia, Croatia, Poland, Portugal, Denmark, Israel, Azerbaijan, Kenya, Bosnia, Malta, Ukraine, Czech Republic, Ethiopia, Greece, Spain, Kuwait, Germany, Venezuela, Colombia, Honduras, and Nicaragua. This all-natural combination of 120 nutrients and phytonutrients (plant nutrients) not only keeps your blood flow to the affected limbs in check (as some drugs do), but actually helps your body rebuild the organs and systems that control blood circulation - without side effects (as drugs do not do). No wonder, our Gangrene Clear-G Formula can produce results that doctors have rarely seen before, even with hard-core prescription drugs. And, unlike pharmaceutical drugs, it is very body-friendly. Without exaggeration we can say that the users of the Gangrene Clear-G Formula are living proof that the nutritional (non-surgical) revascularization is valid and should be considered a preferred method of preventing and reversing foot gangrene, especially in people who suffer from diabetes and/or atherosclerosis. It takes 20 times more energy to heal a wound than to maintain a healthy foot. Our proprietary Gangrene Clear-G Formula is a complete "multi" supporting healthy blood circulation. It has been designed to provide optimal concentrations of vitamins, anti-oxidants, lipotropic factors, chelated minerals, trace minerals, and digestive enzymes as they are all necessary to optimize the blood flow. In other words, our Gangrene Clear-G Formula does not "destroy" gangrene! It helps the body to eliminate its cause, namely, to stop the progression of gangrene through improving and, over a period of time, restoring impaired blood circulation that is known to contribute to gangrene. preventing and/or fighting off the infection of gangrenous tissues. Supplement Facts: Amount Per Serving (1 Scoop) Approx. Xylitol Crystals (Natural Source), Beet Root Powder (Beta vulgaris rubra), Citric Acid, Carrot Root Powder (Daucus sativus), Guar Gum Powder, Lo Han Extract (Momordica grosvenori) (Fruit). Allergen free (Milk, eggs, fish, crustacean shellfish, tree nuts, peanuts, wheat, soy). Refrigerate the jar after opening. Keep out of reach of children. Store in a coll, dry place. Color of this product may vary due to color variantions of the ingredients. WARNING: Do not take this product if you are pregnant, nursing, have an auto-immune disorder, or if you are taking immune suppressants without consulting your healthcare practitioner first. * This statement has not been evaluated by the FDA. This product is not intended to diagnose, treat, cure or prevent any disease. Full of Health® and Clear-G Formula® are registered trademarks of Full of Health, Inc. Although necrotic tissue damage cannot be reversed, Clear-G Formula can help stop or delay further progression of pathological changes and reduce their complications. As you can see, Clear-G Formula consists only of the natural factors vital to the cardiovascular system and present in specific ratios and amounts in order to correct longer standing deficiencies and imbalances that are known to contribute to the common circulatory health problems. This superior dietary supplement has mitigative, preventive and protecting properties. However, there is no one "miracle" ingredient in the Gangrene Clear-G Formula. It is a special and unique, orthomolecular combination of all of ingredients that helps to accelerate the inner self-healing effect. lower insulin requirements (in many cases, better than most prescription drugs). And there appears to be no harm in taking the Gangrene Clear-G Formula. Testimonial: "My Father Was Getting Ready to Die"
I contacted you last year in early December about my father's condition. He had undergone 2 different surgeries on his right foot: one to remove the 2 outside toes, and then a year later the 3 middle toes. At that time, they also did a bypass and thought my father would be OK. He had tried IV chelation a few years ago, and I think that helped him some. Unfortunately, he wasn't able to continue the treatments. I had read enough even then to know that without treating the underlying problem, at best everything being done was no more than putting a band-aid on a huge problem. Fortunately, as I was looking for information on managing the pain for gangrene, I ran across your website. Today, he is still walking OK and there is no smell (only 2 months after the gangrene began to set in). He is relatively pain free and hopeful that he has some time left (he says he is too ornery to die). When I first spoke with you, you said there was perhaps a 50/50 chance that your Formula would help my father, so he agreed to try it. As far as I am concerned, if not for your product, he may not have made his 80th birthday earlier this month, or if he had, I don’t think he would have been as relatively pain free and in a good condition as he was. When I ask him, he comments that he is sleeping well at night, without foot pain waking him up. I know when his toes were gangrenous and pain at night was a big problem for him. My sister, who does not see him as frequently as I do, also commented that his color was looking better than it has in a long time. Thank you for your product. I believe that it is responsible for giving my father some additional time with good quality. I have attached a picture of his foot from the bottom. While I am certainly no expert, it seems to me that the foot is healing. I was even able to remove a large section of dead skin off of the top of the foot this morning and underneath the skin seemed pink and healthy. I am so thankful for this Formula and plan to share the results my father has had with the podiatrist he had been working with. He works with many diabetic patients and is open to alternative therapies. He might find this interesting. Thank you again. I'll let you know how things go in the upcoming months. I just wanted to let you know that my dad's foot now appears to be TOTALLY healed. The 'scab' came off about a week or so ago and the tissue is healthier than it has looked in years. I have attached the pictures of his foot as it is now. I took my father to see his podiatrist last week and he was very happy to see the condition of my father's foot. I brought him an empty jar of your formula. This doctor works with a lot of diabetic patients, perhaps he can steer others your way if they develop gangrene. Thank you again for the work you have done to create this product! * The testimonial above is a true, documented story. It has been reviewed, however, it is the sole opinion of the listed individual. Testimonial: "Ulcers On His Legs Completely Healed"
On behalf of my family and myself, we would like to express our gratitude to your company for developing the Clear-G Formula. My father is a diabetic and due to poor circulation to his legs, he began to develop sores on his legs and foot. The sores on his foot eventually turned black as he developed dry gangrene. After repeated visits to a podiatrist and a vascular specialist, the dry gangrene began to spread and he had to be admitted into the hospital. Both doctors suggested that my father's left leg be amputated from the knee down. I immediately researched the internet to educate myself on what the doctors were stating, to confirm their recommendation. Fortunately, I found the website for Full of Health Inc. and decided to start the treatment and postpone the surgery. After three weeks, the ulcers on his legs completely healed and the black scabs on his toes began to fall off and revealed healthy new skin. The nurse that has been cleaning my father's wounds daily has expressed complete amazement and requested Full of Health's phone number to recommend it some of the patients she treats. The progress that my father has experienced after three weeks of taking the Gangrene Clearing Formula has saved his leg, lifted his attitude and made him feel more energetic. Thank you again for helping families that are faced with loved ones that are only given the option of amputation. And thank you for all your insight and information you provide to my father and I. First, let me thank you for the unique way you created your web site. It was very easy to find and your words were sincerely understood. I’m living proof that gangrene can be reversed. In April 2005, I was in a hospital bed, and about an hour away from a scheduled amputation of the fifth toe of my right foot. I declined the amputation, and two days after taking Gangrene Clearing Formula, the gangrene portion of my toe began to fuse with the non-gangrene area. The rest is history. My toe is healed and the infection is completely gone. No one can believe it. Many are calling it a miracle, especially since the doctors at one of the most well known university medical centers told me that an amputation was the only remedy. Day after day as I changed the dressing on my toe, I was amazed to observe steadily growing white healthy tissue. Eventually the gangrene of the affected part came off and the remaining part of the toe healed nicely. I’m happy to have saved most of my toe, in light of the fact that the surgeons wanted to amputate it all the way up to the metatarsal bone in my foot. I must admit that it took courage and close to five months for a complete healing, but it was well worth it. The most important thing here is that the gangrene was REVERSED! Your Formula specifically targeted the problem and is very potent. It really works!!!!! I might add that you were always available to me for personal support. Also, my sugar is now under control without insulin. With no doubt, development of foot or leg gangrene - to a great extent - is related to what you eat and how often you move. In most cases, unhealthy lifestyle - faulty diet and physical inactivity - contribute to the production of degenerative changes in the body, such as diabetes or atherosclerosis. There is strong evidence that exercise and stress reduction - if done regularly - are both protective of the cardiovascular system and supportive of the immune processes. Foot Gangrene: Don't Mess with Diabetes! Approximately 25 percent of almost 20 million diabetics in the United States will develop foot problems and 6 to 10 percent will undergo amputation (data for 2004). Among the urologic complications of diabetes mellitus, the most common form of organic sexual dysfunction in male diabetics is erectile impotence. Up to 75 percent of male patients who had diabetes for 15 - 20 years suffer from this disorder. Here's an illustrated timeline compiled by a devasted son telling the tragic story of the last days of his diabetic elderly mother. You come to your own conclusion. July 28th, she left hospital to enter a nursing home. August 1st, she was admitted to a hospital. August 6th, she was discharged from the hospital back to the nursing home - without an explanation and despite the fact that the deteriorating condition of her foot was obvious. September 16th, her son arranged a consultation with an alternative doctor, with the help of a secretary. October 5th, she was admitted by the alternative doctor to another hospital. October 6th, her three toes were amputated; unfortunately, an above-knee amputation was required, an operation she could not survive. October 7th, a fortnights wait for her death. October 20th, she passed away. If you have been negative about using medical alternatives, please set aside your negativity, if any, and simply think of enhancement of the human welfare and well-being for all. A little bit of goodwill can go a long way. Those who rank nutritional supplements low simply put them up against drugs. But that is unfair. This is comparing apples to oranges. Nutritional supplements should NOT be viewed exactly the same as prescription medicines. While they are very effective, dietary supplements do not behave the same way as drugs. They work more like diet. Therefore, the idea of using one single nutrient or herb alone for a particular ailment and expecting results is a not a natural, but rather a medical approach, so typical in Western culture. Nutritional supplements should be viewed and used in a totally different way – as a part of a holistic approach, namely, by combing both medical and alternative forces. The beauty of the Clear-G Formula, provided it is used correctly, is that - because of its balancing function - it is not needed forever, as opposed to drugs which often alter and/or suppress the physiological or psychological functions of body systems. Although mainstream medicine and pharmaceutical treatments can be helpful and even lifesaving in certain circumstances, few are able to regenerate health because they are focused on the symptoms - not the root cause of the health issue. Drugs typically mask the symptoms of disease rather than resolving the cause. There is no medicine that can alone create good health. True healing will be manifested when the root cause is addressed and the body is balanced – only then will the body be able to heal itself. The body is a redundant organism: it prevents failure of an entire system upon failure of a single component. As a result, our body’s compensating (or redundant) systems often mask the root cause of an imbalance or health issue. Although these malfunctioning areas need to be healed, we should not get side tracked trying to fix a compensating organ -- because when we clear the root problem (in case of foot gangrene, severely impaired blood flow), the body will begin fixing itself. Is everything I’m doing addressing the root cause? Are the supplements and medications I’m taking fighting the cause? Is the protocol and treatment I’m pursuing addressing the cause? If your answer is “No,” we recommend you reconsider and explore the nutritional approach to gangrene. At Full of Health, we hope that you will take action and give the nutritional approach serious consideration; it can help you get and keep gangrene in your feet or legs under control without harmful drugs or humiliating surgery. Think, feel and act positive. Be more concerned with what is right than with who is right. All-in-all, gangrene is a serious, life-threatening condition! Discover what many people still don't know, or do not want to know about nutritional gangrene control; your life, or the life of someone you know or hold dear, may depend upon it! By sharing this information, you can discomfit those who desperately want to believe that conventional medicine has all the answers worth considering. We hope everyone with a relative or friend with diabetes or atherosclerosis effecting the brain, legs or heart, will at least open the door to them to alternatives. © 2000-2017 Reverse Gangrene.com: Clear-G Formula. Stop the Progression of Foot Gangrene | Avoid Toe, Foot or Leg Amputation. All rights reserved worldwide. This document may not be copied in part or full without express written permission from the publisher. The information on reversing gangrene nutritionally provided herein is a general overview on this topic and may not apply to everyone, therefore, it should not be used for diagnosis or treatment of any medical condition. While reasonable effort has been made to ensure the accuracy of the information on reversing diabetic and non-diabetic dry gangrene naturally, Full of Health, Inc. assumes no responsibility for errors or omissions, or for damages resulting from use of the information herein.